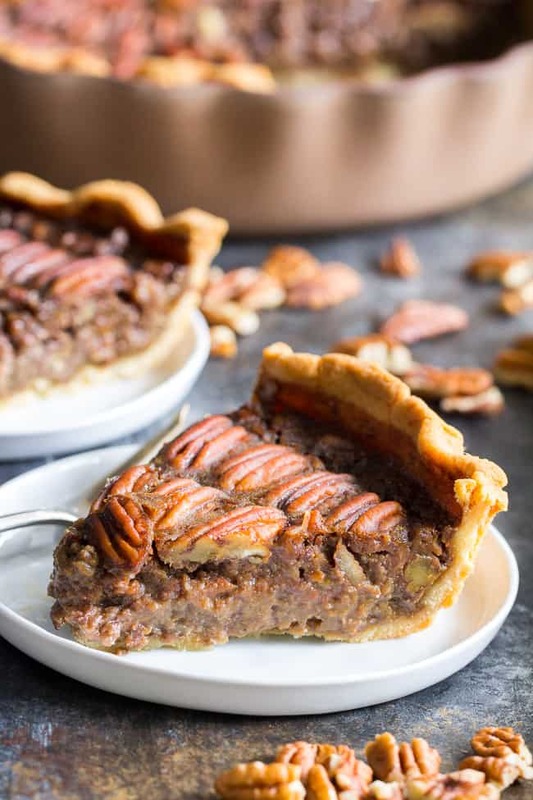 This salted caramel pecan pie is made with an easy dairy free salted caramel sauce and flaky grain free pastry crust (with a dairy-free option) for a rich gooey and sweet paleo dessert for the holidays or any special occasion! As it usually does, time is creeping away and pie is now on the horizon. “What is this nonsense? !” You might be wondering. But you read me right – pie is on the horizon, and this, my dear friend, is why you’ve visited me today, I presume. 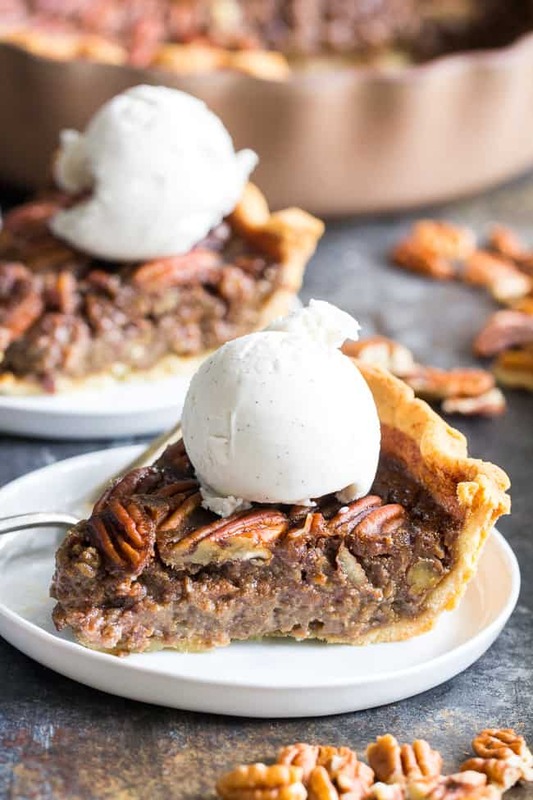 Yes, it’s still me and I’m still here and mostly sane – just finding a new way to introduce to you yet another Thanksgiving/Holiday themed dessert – Pecan Pie! And, FYI, by “cool kids”, I’m talking about me and you, of course. Since as long as I can remember, Thanksgiving has been my family’s jam. In fact, it was basically the only home-cooked dinner we had the entire year for many, many years, save for the odd chicken cutlet with rice and corn. Anyhow, Thanksgiving became really special for me growing up as an undiscovered lover of home cooking, and, of course, baking! In full disclosure, we never actually baked our own pies, but the pies were important, you see. We lived for the stuffing and the pies and not much has changed in that way. As far as the pies went, we always had the same 4 varieties on the table, every year. Four pies between exactly 6 people around the table – sounds like a good pie/person ratio to me, don’t you think? The pies were, in order of my favorite to least favorite, were as follows: 1.) Apple 2.) Pumpkin 3.) Pecan 4.) Coconut Custard. That was my pie order as of the age of 10, however, today, I would have a much tougher time with the order. I think apple might still be #1 though. And clearly, I’m doing nothing to sell you on this salted caramel pecan pie right now, am I?! 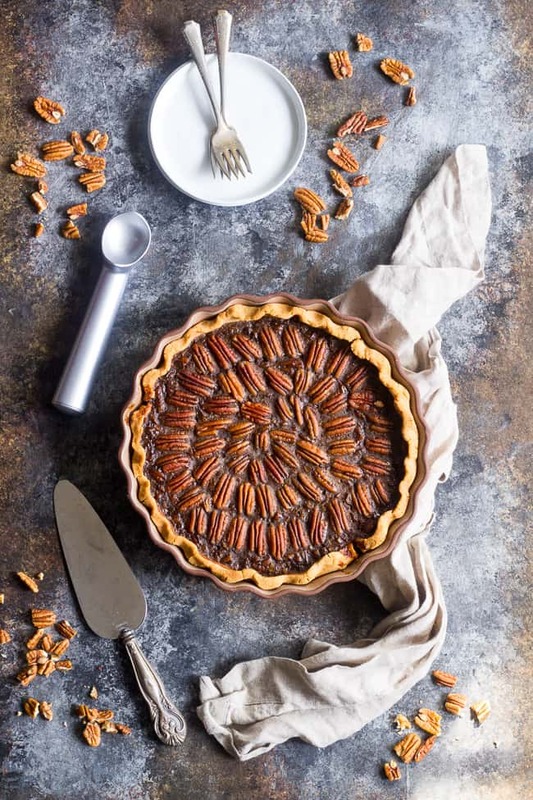 This pecan pie, however, is most likely not the pie you grew up with (ya think?!). Making gooey and sweet pecan pie without any dairy or refined sugar can prove to be a challenge, for sure. I decided to go the salted caramel route with my pecan pie for a couple of reasons. 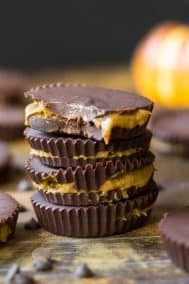 First, dairy free salted caramel is SUPER easy to make on the stovetop. And no, you don’t taste the coconut milk once it’s caramelized! Those of you who read often have seen first hand how much I love my salted caramel lately. We have my classic paleo pie crust (I linked to the recipe below but you can also find it here). In order for the filling to bake into a custard, we’re whisking eggs into the cooled salted caramel, along with maple-soaked pecans (literally just let the pecans sit in maple syrup! ), vanilla, and a bit of cinnamon. The rest happens in the oven (and on the table!). I hope you guys enjoy this salted caramel pecan pie as much as we did! Now, let’s bake! In a medium saucepan, whisk together the coconut milk and coconut sugar over medium heat. Bring to a boil, stirring or whisking, then lower the heat a bit so that the mixture is bubbling but not overflowing. Continue to cook, stirring occasionally to avoid any burning, for 15-20 minutes or until mixture is reduced and a deep caramel color*. Once removed from heat, stir in the salt and vanilla extract. After preparing the caramel, allow it to cool at room temp for at least 1 hour before continuing with the filling. Mix the chopped pecans (saving the halves for the top of the pie) with the maple syrup, 1/2 tsp vanilla, cinnamon, and pinch salt. Allow them to sit for 10 minutes. Whisk the eggs into the salted caramel (after an hour of cooling) 1 at a time until smooth, then stir in the pecan mixture. 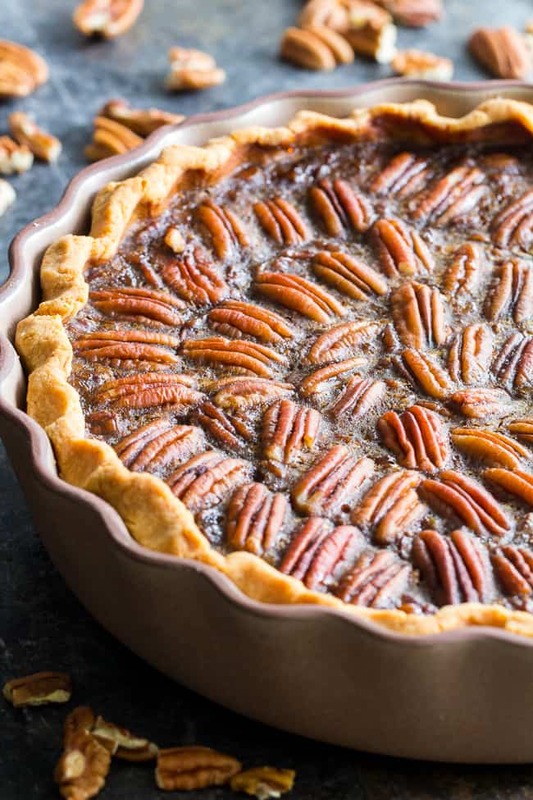 Pour filling into partially baked crust, then arrange pecan halves on the top of the pie. Bake in the preheated oven for 45-50 minutes, until center is set and crust is golden brown. Allow pie to cool completely at room temp before serving for easy slicing - if you plan to refrigerate before serving, make sure to first cool completely at room temperature before chilling. Pie is best served at room temp or cooler for easy slicing. Enjoy! *Time will vary based on your stove, this step should not take longer than 25-30 minutes and may be as quick as 10-15. Want More Paleo Holiday Dessert Recipes? Try One Of These! What pies are at your Thanksgiving table? This looks so good!!! ? Can this be made ahead of time. How long will this keep? Yes it can, I’d say you can refrigerate it up to 3 days and then just let it sit at room temp for awhile prior to serving. Wow! This looks absolutely amazing and I can’t wait to make it for Thanksgiving! Just out of curiosity – do you think a flax egg would be able to replace the eggs in the filling or the crust? I haven’t tested this so I’m not sure. I’ve been meaning to test my crust recipe with a flax egg though! 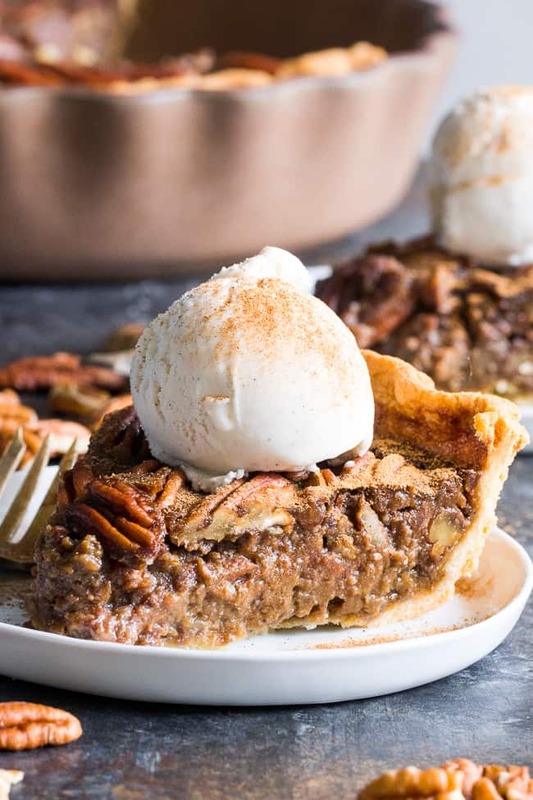 Thank you so much for this A-Mazing sounding recipe, this is my sweet hubs favorite pie and his first Thanksgiving since giving up gluten and sugar to help me be more healthy, so I really want to get it right! I am not seeing at what point you put the vanilla and salt into the salted caramel, I see that you mix the coconut milk and sugar together and cook, is the vanilla and salt added after it cooks? Please forgive me if I missed it…I’m constantly in a migraine which make reading hard…lol! Well thank you again, looking forward to making this treat! I’m doing this recipe right now and I also had the same question….and I’m finding that I should put the vanilla and salt in when you remove the caramel from the heat….otherwise it doesn’t reduce very quickly at all…I’m looking at it right now…and have started another batch without the vanilla which seems to be going better. Hope this helps? Just made this for our “Christmas in July” dessert and it is amazing!!! I’ve been loving this crust with quiche and it was equally delicious with a sweet pie! 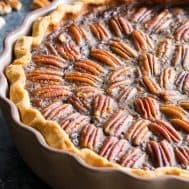 Super easy (a few steps, but all simple) and I actually liked the flavor better than some traditional pecan pies I’ve tried where it’s so sweet I feel like my teeth are going to fall out! Yay! I’m so thrilled you liked it, and also loving the Christmas in July! I do not see when the vanilla and salt go in to caramel. This looks like an amazing recipe. I had a question about the salted caramel sauce. When do you put the sea salt and vanilla extract in the sauce? I was looking at the instructions but couldn’t find it. Thanks in advance. After the sauce is removed from heat – I’ll add that in now! I love pecan pie and caramel, but not salted caramel so much. Would it still be good if I only added a little salt? Or does it really need all the salt? Hi! 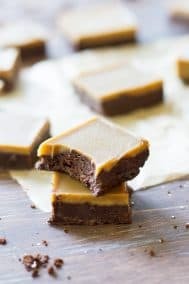 I’m making this pie right now for Thanksgiving and I feel like my salted caramel mixture is no where near thick enough but I’ve had it on the stove top for 25 minutes, it’s definitely a nice shade but super liquid, is that okay?? I made this for Thanksgiving. I don’t like things that are overly sweet, this was perfect! It will be a regular for me! 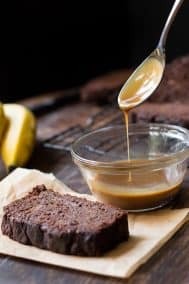 For the caramel sauce – can you sub date paste for coconut sugar? What alternatives would you suggest for someone who can’t eat coconut?